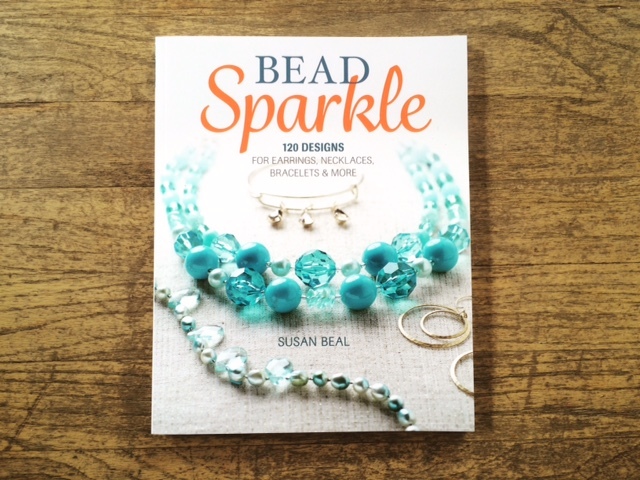 I’m so excited to announce my new book, Bead Sparkle! 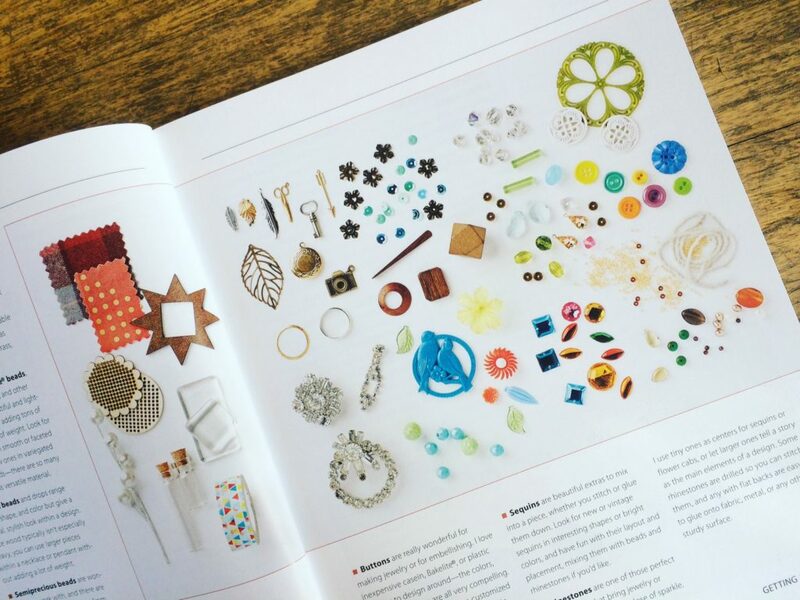 It includes 120 jewelry and accessories projects to make, using all the things I really love – vintage bits and pieces, semi-precious stones, glass, wood, metal, pearls, crystals, broken jewelry, family treasures, charms, washi tape, fabric, pearl cotton, buttons, silk flowers, and really, just about anything else you can wire-wrap, glue, or stitch. 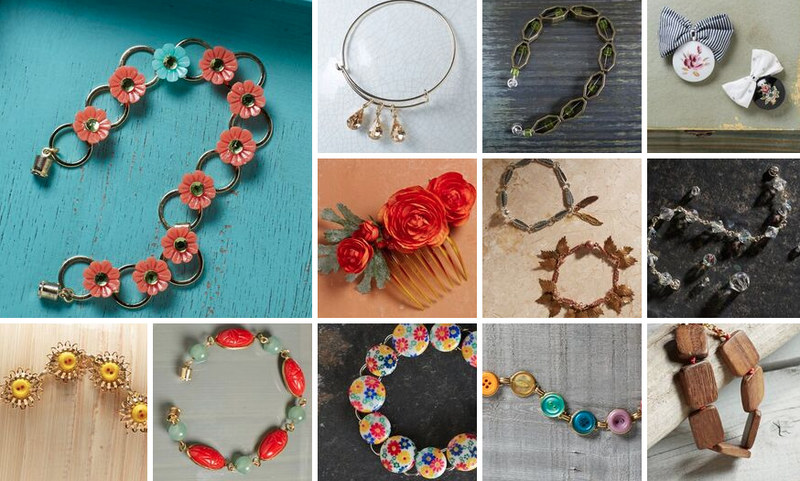 The 40 projects, which each have 3 spin-off variations, are accessible enough for beginners to try with confidence, but I really encourage you to use the step-by-step tutorials as a starting point: create pieces in your own style, mixing vintage, new, found, and unexpected treasures for your very own unique jewelry. And to celebrate, I’d love to give away a signed book paired with a special hand-picked collection of vintage beads, buttons, charms, and ephemera in your favorite colors and styles! Please read on for all the details! 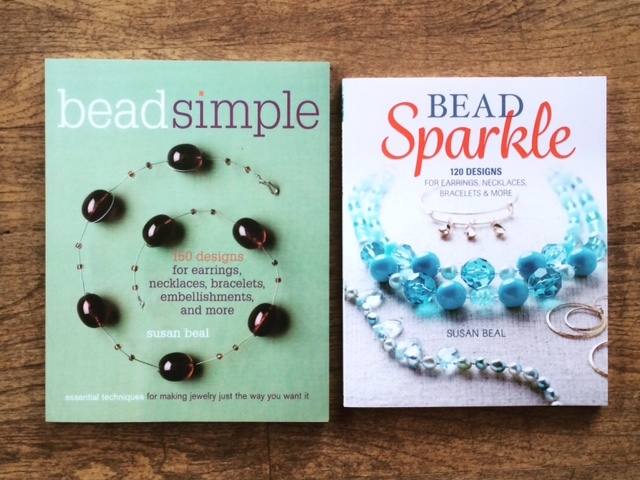 Ten years ago I wrote a jewelry-making book called Bead Simple. I poured my heart into that book, designing 110 projects myself and asking 40 of my favorite designers to each contribute a guest piece as well. It came out in March 2008, just a couple months before my daughter Pearl was born, and now she’s in third grade! Over the years, it’s gone into new printings, spun off craft booklets, and a friend even spotted it on his trip to Thailand a few months ago. I feel very lucky to try my hand at a sequel all these years later, this time focusing on the extra-special pieces that add a little sparkle to your life, whether it’s a quick accessory to brighten up a Tuesday morning heading to work, or making something pretty to wear to a New Year’s Eve party with a new dress. The same amazing illustrator from my last six books, Alexis Hartman, updated her beautiful watercolor technique illustrations for this new collection, as well as creating new ones. Her work is just gorgeous and I am so happy to have her contribute again! For the projects, I went in lots of fresh directions – there are so many amazing materials available now, it will make your head spin. Timeless techniques like beading, wirework, and knotting play nicely with cross-stitch, botanicals, painting, glass, paper, collage, and embellishments. I got to make a few pretty things with my favorite Pendleton wool and Cotton + Steel and Denyse Schmidt fabrics! 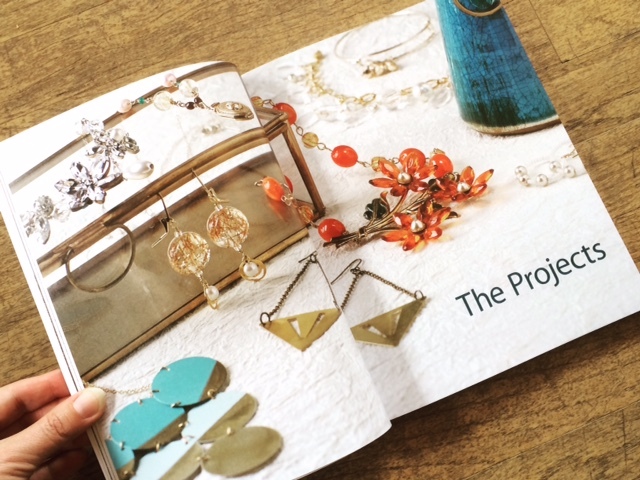 And I took one of my most favorite approaches to designing, vintage gone modern, and turned it into a stand-alone 3-project section at the end of every chapter, from necklaces and pendants to earrings and accessories. This time, I asked a few of my favorite designers to each contribute two designs – so you’ll see gorgeous pieces from Kayte Terry, Christina Batch-Lee, Torie Nguyen, Cathy Zwicker, Michelle Freedman, and Lynzee Lynx Malsin. Here are a few of the pieces in the book! 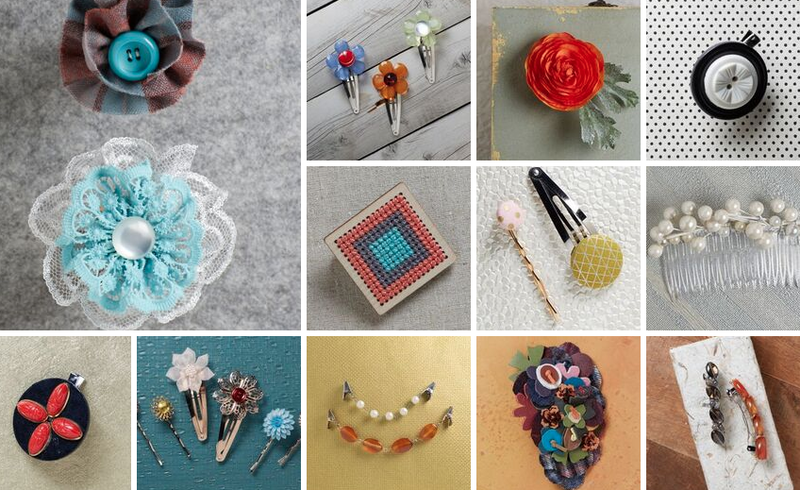 My first Bead Simple event is coming up on Sunday, September 25, from 2-5 pm at the Division St. location of collage. Please come by anytime to make your own Sparkle Jar Pendant to take home, and get your book signed! It’s a free make and take, and you can choose from all kinds of sparkly things to spotlight inside your little pendant jar – sequins, beads, buttons, sand, tiny treasures, and more. It’s beginner- and kid-friendly and you’ll leave with not just a pretty piece of jewelry, but a super-handy wirework technique to use in your next project! More details on this, and a few more events, soon! 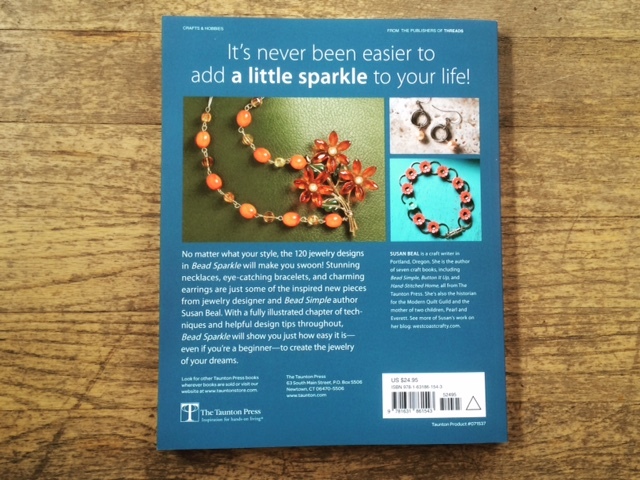 You can find Bead Sparkle at Collage, Powell’s, Amazon, Barnes & Noble, Dava Bead, or your favorite local bookstore. Thank you to everyone who’s had kind words for my book – I can’t tell you how much I appreciate it! 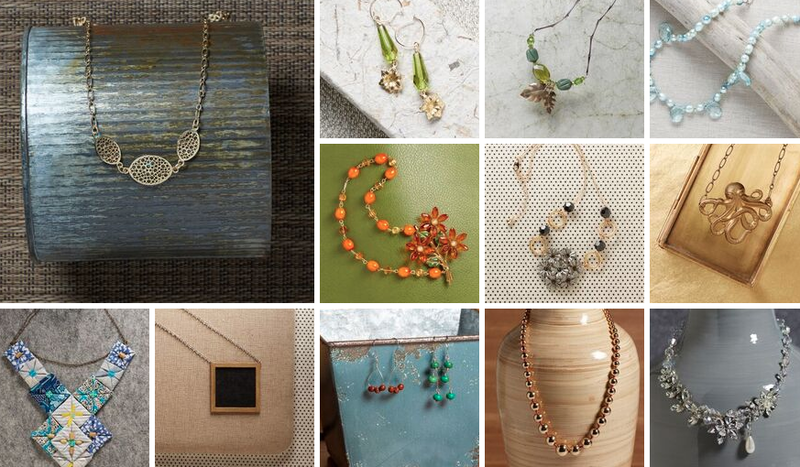 UPDATE: Thank you for the wonderful comments about your favorite pieces of jewelry! I love them. I drew a winner on Friday night, and will be in touch to send the hand-picked vintage and new supplies… Elisa won! So beautiful, I would love to get back into beading… I’ve taken a bit of a hiatus to play with fabric. I like the idea of combining the two. Oh, my favorite piece, I forgot!!! It was a necklace gifted to me by the ladies I worked with at a bead store on my last day. 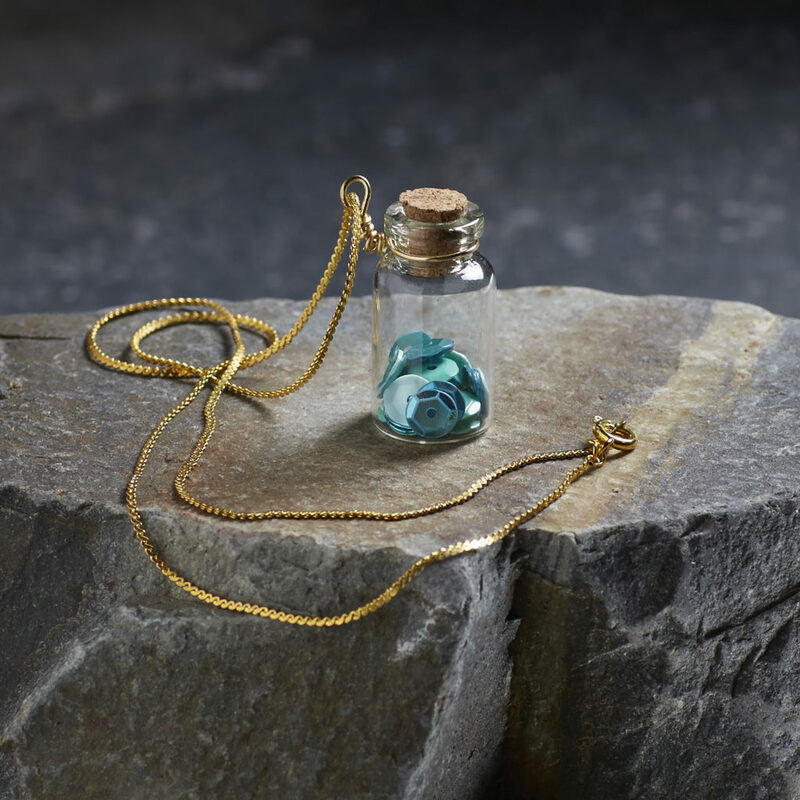 Shades of green and turquoise with silver. However, it was stolen with all the rest of my jewelry a couple years ago. bead sparkle party at collage! sheep to shawl, February 7! My favorite piece is the necklace that I wear everyday. It is simple and silver but it has baubles and charms that I have collected over time. There is a M is for mom, a tag that says inspire, a tau cross from Italy that I picked up to represent being Franciscan, a 3D heart, and another little heart tag and a pearl bauble. I get a lot of comments on it for being something that I just pieced together. I’m wearing a favorite pair of earrings today. My husband bought them for me when we were dating, and they are simple drop earrings (my favorite to wear) with olive green beads. The green goes well with everything! I will go with the tiara I made for my wedding day. I was influenced by Mary Blair’s sketches for the Small World ride at Disneyland, plus it was my chance to use some ultra-rare Swarovski beads I had stashed for years. My favourite piece is my new-from-old wedding ring. I had it made by an amazing craftsman from my original wedding set (which I wasn’t super-fond of), my ‘pet rock’, a diamond I’d bought for myself when I was 19 (cuz I figured I’d probably never find a man to buy me one) and 2 heart shaped amethysts that my grandpa bought for me as earrings when I turned 21. I absolutely love it, and love looking at it. My favorite piece of jewelry is the ring I had made for me several years ago–a simple silver band with a tiny strip inlaid tourquoise, lapis, brass, and carnelian inlaid. Your new book looks wonderful! It’s so hard to pick a favorite, but I’ll go with a necklace I made years ago. It started with a key chain a friend brought me from Hawaii- a hula girl whose hips shake and is wearing a fake grass skirt. She became the centerpiece for a necklace celebrating the kitschy Hawaiian vacation. There are shells, pineapples, palm trees, tikis, fish, various polymer clay beads featuring beach scenes, the word “aloha” spelled out, everything I could find that said “Hawaiian vacation” to me. I’ve never been to Hawaii, but I hope to go someday and see if my vision is correct! Hi Susan. Congratulations on your new book! I can’t wait to see it! Several years ago I was in Seattle with a friend and fell in love with a pair of earrings at Pike Street Market. They’re bead earrings, green with black polkadots. She insisted on getting them for me for my birthday. I always think of her when I wear them, which is frequently. My favorite necklace is an abstract piece that my aunt had made from gold jewelry that she was tired of wearing. The pendant sane had made looks a bit like a tree and I love it! So beautiful, I would love to get back into beading…I’ve taken a bit of a hiatus to play with fabric. I like the idea of combining the two. Oh, may favorite piece, I forgot!!! It was a necklace gifted to me by the ladies I worked with at a bead store on my last day. Shades of green and turquoise with silver. However, it was stolen with all the rest of my jewelry a couple years ago. Congratulations on the new book! My favorite piece of jewelry would be my engagement ring which is a garnet surrounded by little diamonds. 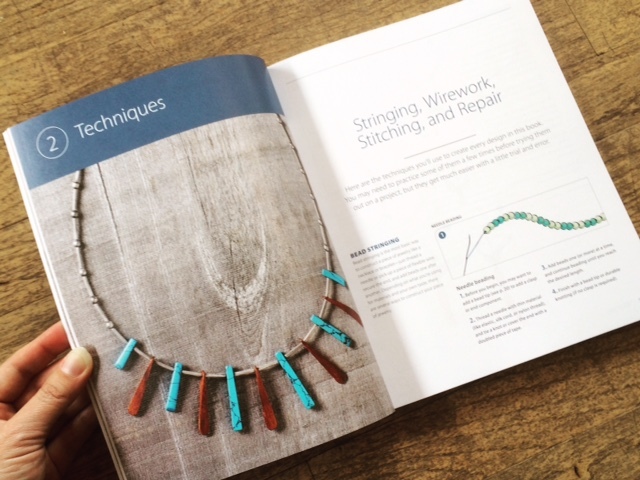 Of jewelry I make I’m currently loving Miyuki delicas and beading on a loom – wonderful bead sparkle there. My favorite piece of jewelry right now is a necklace my mother gave me for Christmas that her mother gave her. It is a gold heart with three little diamonds floating in the middle. I have three young children and they love to sit on my lap and point to each diamond that represents each of them. I haven’t taken it off since I received it. It’s really hard to pick, because I have a lot of pieces that I love, from my gold Special Forces crest (a gift from my husband) to my vintage saint medals that I bought at various flea markets in europe. I can’t wait to see your new book and be inspired by your beautiful creations! I’m going to order one for me and one for my mother. She enjoys all sorts of creative project, and she loves your books! Congratulations on the new book Susan! It looks lovely!